To insure effortless, high-level academic performance our children need to work with their motor skills starting in infancy and in early-childhood. From this basis, age-appropriate speech, language, and behavior will progress. Dr. Jean Piaget, the Swiss child psychologist, recognized that sensory-motor intelligence provides the foundation for a child's ability to abstract, generalize, analyze, and integrate the world around them. In other words, a child's ability to communicate and learn is based on early, adequate sensory and motor-skill development and integration, as well as a stable emotional development. In our primary years we develop in a verticality. We first turn and sit. Soon we crawl, stand and, finally, walk upright. In this process we learn to walk in a controlled and coordinated manner, balancing our pace with smooth, fluid motions. By the time of school-readiness our controlled vertical posture and well-coordinated movement should become stable and effortless. This optimally coordinated movement and vertical posture allows us to listen, communicate, act and interact independently. 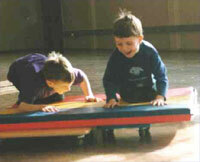 So it is within this specific foundation that a wide range of movement and communications skills emerge. These include drawing or writing in school or performing complex and high-precision motor activities like playing the violin, figure ice-skating, flying an airplane, and multitasking. Balance and coordination movement are prerequisites to developing attention communication, learning or work skills.